Green olives, fresh herbs, and crunchy seeds embellish the pairing of baby carrots and broccoli for a simple, savory salad.This is the kind of salad that has good staying power, as long as you take care to cook the broccoli just until it’s barely tender-crisp and still bright green. It’s even better the next day, and is a nice little side to include in your lunch. Photos by Hannah Kaminsky of Bittersweet. Combine the broccoli florets in a skillet with a small amount of water. Cover and steam for 3 minutes or so, just until tender-crisp. Transfer the broccoli to a colander and refresh under cool water to stop the cooking process. Drain well. 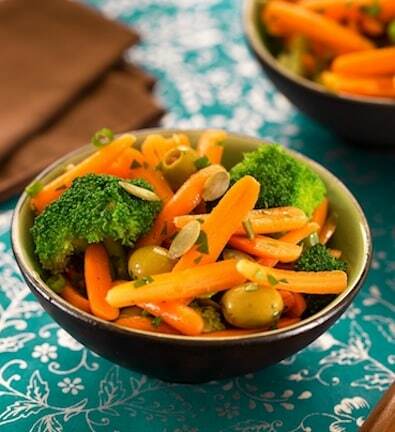 In a serving container, combine the broccoli with carrots and all the remaining ingredients. Toss well. Serve at once, or cover and refrigerate until needed. 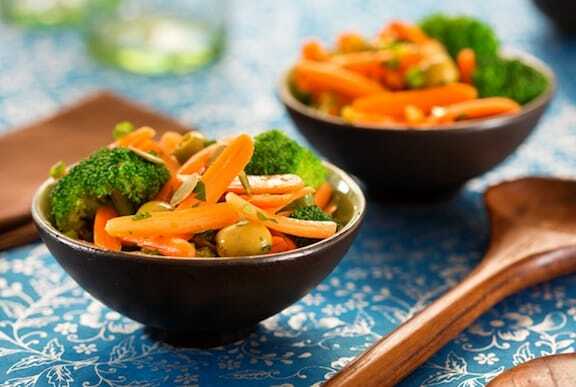 Here are more of VegKitchen’s Super Savory Salads.